Thanks to our users, Nimble has consistently been voted Leader in both CRM and Sales Intelligence Categories over the past four years. 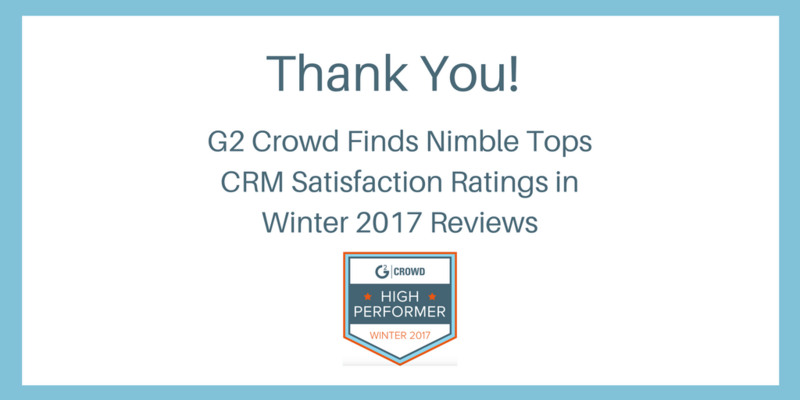 We are honored and humbled to announce that Nimble was named both Market Leader and #1 in Customer Satisfaction on G2 Crowd’s Winter 2017 rankings. Each month, more than a half-million people visit G2 Crowd’s site to inform better purchasing decisions for their businesses. Technology buyers, investors, and analysts use the site to compare and select the best software based on peer reviews and integrated social data from over 80,000 users. “Nimble has built the best Operating System for Salespeople — We’ve combined the best in sales enablement and engagement including simple smart CRM, Sales Intelligence, Email Tracking and Marketing Automation to help companies grow,” said Jon Ferrara, CEO of Nimble and founder of the pioneering CRM, GoldMine. The G2 Grid℠ report on CRM software is an in-depth report of 148 CRM vendors based on reviews from over 4,594 business professionals. Nimble was named CRM and #1 in Satisfaction ahead of Salesforce, Zoho, and Hubspot CRM. CRM products help companies track and manage sales interactions in a single system. Organizations rely on CRM to record customer information to ensure team members share the same data when they interact with their customers. This type of software is used primarily by salespeople, but also for upper management and support teams. Nimble was named a High Performer based on receiving a high Customer Satisfaction score and having a large Market Presence. Nimble earned #1 in overall Customer Satisfaction because it was rated well above the competition for Quality of Support, Ease of Use, Meeting Company Requirements, Ease of Administration, Ease of Doing Business With Nimble, and Ease of Setup. Overall, users were least-satisfied with the Social Collaboration features and Social Network Integration capabilities of CRM products. Nimble has prided itself on being a market pioneer of Social Sales with its numerous social network and data integrations, resulting in Nimble achieving top ranking for Social Collaboration Features and Social Network Integrations. Nimble’s integrations with public social networks allow users to obtain critical contact details to inform their sales outreach and customer follow-ups. The G2 Crowd’s CRM Grid SM Report uncovered that CRM users were least satisfied with Social Collaboration (73% avg. rating) and Social Network Integration capabilities (72% avg. rating). Nimble cruised to the top of the rankings for both Social Collaboration and Social Network Integrations. Overall, users were least-satisfied with the Social Collaboration features and Social Network Integration capabilities of CRM products. Nimble has prided itself on being a market pioneer of Social Sales with its numerous social network and data integrations, resulting in Nimble achieving top ranking for Social Collaboration Features and Social Network Integrations. Nimble’s integrations with public social networks allows users to obtain critical contact details to inform their sales outreach and customer follow-ups. These awards follow recent accolades for Nimble, including: King of CRM by GetApp, #1 in CRM Value, #1 CRM in Customer Satisfaction and CRM Market Leader 3 years in a row by G2 Crowd. Nimble was also recognized previously as #1 Sales Intelligence in Customer Satisfaction and overall High Performer. 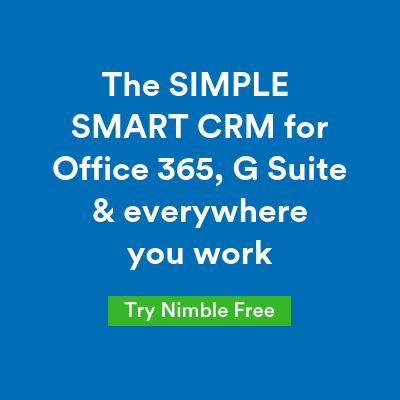 Nimble was named #1 CRM in numerous other reviews over the past six months including; #1 CRM for Small Business by TechnologyAdvice, Highest Rated Software by Small, Mid-Size and Enterprise Business Users, Highest Rated CRM, Highest Rated Sales Intelligence, Best Software 2014 and Highest Rated Ease-of-Setup. Nimble was also recognized previously as #1 Sales Intelligence in Customer Satisfaction and overall High Performer. G2 Crowd is the world’s leading business software review platform, leverages more than 80,000 user reviews to drive better purchasing decisions. Technology buyers, investors, and analysts use the site to compare and select the best software based on peer reviews and synthesized social data. Monthly, more than a half-million people visit G2 Crowd’s site. G2 Crowd aims to bring authenticity and transparency to business technology research. For more information, go to G2Crowd.com.